Can we learn more about ancient cultures than what secular sources provide? Is there a perspective of history, which allows us to see God’s ongoing purpose and plan? 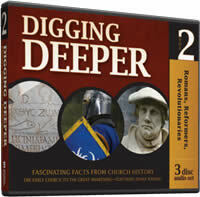 In this exciting curriculum, you will explore these questions, dig deeply into the best resources available, and discover world history from a truly biblical basis. Romans, Reformers, Revolutionaries studies a tumultuous time in history when the Church explodes throughout the world, uncharted regions are explored, distant cultures are united, and religious wars burst into flame. Technology, medicine, philosophy, and art sweep nations into bitter turmoil and proud independence. Through it all, you will see God moving behind the scenes to accomplish His purposes, inviting kings and peasants alike into His kingdom. This teacher guide supplies a structure that can be easily modified for the particular needs of your students. It provides multifaceted creative ideas, teacher tips, and spiritual application to spark your students’ discovery and exploration of the amazing events of ancient times. Grades 6 & up. Hardcover. 384 pages. Meeting the varied learning styles and perceptual modes of today’s students (visual, auditory, and kinesthetic), young people will explore history through fun and exciting exercises, plus activities that allow them to interact with and learn the material. Far from just memorizing names and dates (the standard procedure in most history classes), this fascinating book captures students’ attention and results in life-long learning. Grades 6 & up. Softcover. 360 pages. A great tool for a more traditional test of knowledge gained, this kit includes a unit test and answer key for each of the nine units in this volume of the curriculum Grades 6 & up. This fun activity book is designed to help K–4 students learn about the chronological flow of world history and God’s faithfulness in history while doing activities at their own level. Especially useful to keep younger students “connected” to what their older siblings are learning. Grades K–4. Softcover. 80 pages. Diana Waring’s lifelong pursuit of history’s hidden treasures is available to you in her quick-witted, enthusiastic storytelling on four compact discs. Discover the truth behind the fables of emperors, popes, rebels, and dreamers who changed the course of nations. Witness the sovereign hand of God guiding human civilization from the fall of Rome to the Age of Revolutions. Grades 5 & up. 4 audio CDs. Presented in a storyteller’s enthusiastic manner, these accounts of people and events are supplemental to the material heard in What in the World? Volume 2. This 3-CD set contains more short vignettes of history, short biographies of fascinating people, and short descriptions of incredible events, all told in Diana’s internationally renowned, enthusiastic, and captivating style. Grades 5 & up. 3 audio CDs. To fully understand the times of world history, one must understand the history of the church. Diana whisks you along through 1,700 years of church history, showing God’s amazing grace through it all! Each CD focuses on a different time period, including “The Exploding Church,” “The Church in Charge,” and “The Reforming Church.” Grades 5 & up. 3 audio CDs. This is a worshipful, glorious album of church hymns from the early Church to the Great Awakening! Designed to be used by families in home worship, by families in the study of Romans, Reformers, Revolutionaries, or by those who simply desire to listen to Christian meditative music. Exalt our God together with the music of the ages, in all new arrangements by Mary Beth Cecil. A cappella vocal music. All ages. 1 audio CD. IT'S BACK!!! To fully understand the times of world history, one must understand the history of the church. Author Diana Waring whisks you along through 1,700 years of church history, showing God’s amazing grace through it all! 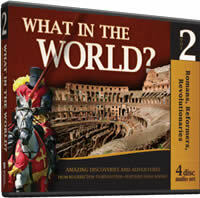 This audio CD set adds to the study of the times, both for Romans, Reformers, Revolutionaries and for World Empires, World Missions, World Wars. 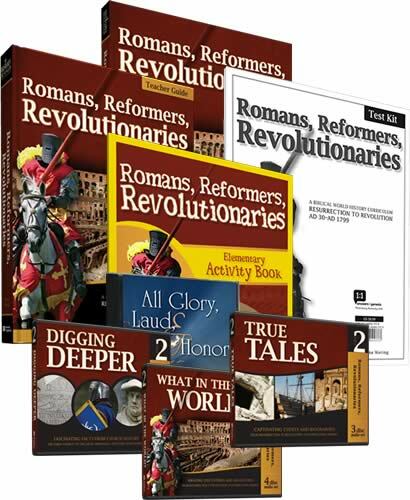 Volume 2, Romans, Reformers, Revolutionaries, studies a tumultuous time in history (AD 30–1799) when the Church explodes throughout the world, uncharted regions are explored, distant cultures are united, etc.